If you play the piano, there is a good chance that you are against owning a portable keyboard. Many pianists feel that, without an analog piano, their music is not as vibrant as it could be. Because of this, they feel that they have no use for a portable keyboard. However, nothing could be further from the truth. Keyboards are used by professional musicians constantly, for many reasons. Whether you own or have access to a quality piano or not, a portable keyboard is a tool that can enhance the way you engage with your music. One often overlooked benefit of a portable piano keyboard is the ability to connect to a computer to take your songwriting to the next level. 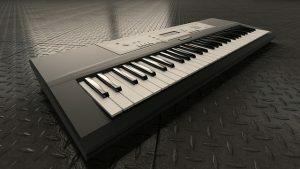 Most electronic keyboards can be connected to professional music software and allow you to record, edit, and write music in real time. This function can allow you to take the music you write on your piano, and convert it to digital form to be sent to publishers or agents. An electronic keyboard is an essential tool for taking your art to the next level professionally. Having a battery powered portable keyboard that you can carry around is also very useful creatively. Many artists find that being cooped up playing in the same spot stifles spontaneity by caging the mind. With a portable keyboard, you have access to the option of a change in scenery that can make all the difference. Next time you have writer’s block, you could try playing in the garden or in another room. Let your creativity flow with a portable keyboard! Very useful if more than one member of the family plays also. First, look at the number of keys. A full piano has 88 keys, though most of these are only used in very advanced songs. For a casual pianist, a keyboard with 61 keys will suffice for almost all pieces you may feel tempted to play. For professional use, you should look for 88 keys. Even for a student just learning, a keyboard should have a minimum of 61 keys. Less keys than 61 means that the keyboard is a toy, not an instrument. Keep in mind that many keyboards will incorrectly label themselves as “full” or “complete;” always count the keys before making a purchase. Key width is an important factor to consider. A feature of good portable keyboards is a key width identical to an ordinary piano. 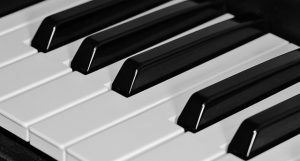 Playing a keyboard with significantly different key widths than standard pianos will mean that when you try to play a piano, you will have a very difficult time adjusting! If you are already used to a piano, the keyboard will feel strange and cramped to you. If you are new to the instrument and looking for the best portable piano keyboard for beginners, learning on a non-standard key size will permanently cripple your ability to play on standard instruments. Either way, it is essential to look for keys that are between 22 and 24 millimeters for the white keys and between 13 and 15 millimeters for the black keys. This is the standard variation for real piano keys. As any pianist knows, an essential part of correctly playing the piano is the ability to hit some keys harder than others. This helps separate voices in piano pieces, and is an absolute requirement for getting the full breadth of the sounds a piano can offer. For a portable keyboard, touch sensitive keys are an absolute requirement. Any keyboard without this feature cannot be used to play real piano music, and will only frustrate the user. Yamaha is among the top manufacturers of electronic keyboards. They have an extensive line that ranges from keyboards intended for beginners to keyboards suitable for professional studio use. Yamaha pianos are known for being reliable and solid, able to take a beating and keep playing great music. They have excellent customer service, so if a keyboard does not live up to your expectations, it is likely that your program will be resolved. Casio is another trusted keyboard manufacturer. While in the past they had a reputation for poor quality, Casio has made high end keyboards a priority in recent years. Known for their innovation and marrying classy design with high performance, Casio keyboards are often cutting edge. For a sleek, functional portable keyboard, look no further than Casio. To buy any of these keyboards, you can go to your local music store, or just go to Amazon.com. Amazon is a convenient way to get instruments, as well as extras like stands or sheet music, delivered right to your door. In most cases, a keyboard from Amazon may come with free shipping, so you will likely save money over going to a physical store. Amazon also lists product specifications, making it easy to compare features and get the keyboard that is right for you. As you can see, a portable keyboard is right for almost anyone who enjoys playing the piano. 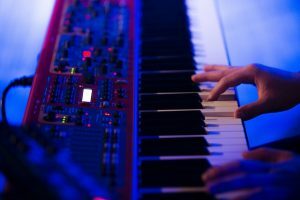 Whether you want to play music in more places, are just learning to play, or need to professionally record music to the computer, a portable electronic keyboard will suit your needs. When making the purchase, just remember to get a keyboard with the specs you need from a manufacturer you can trust. Try looking on Amazon.com first for a great deal! PortableKeyboardPiano.com is a participant in the Amazon Services LLC Associates Program, an affiliate advertising program designed to provide a means for sites to earn advertising fees by advertising and linking to amazon.com. Amazon, the Amazon logo, are trademarks of Amazon.com, Inc.